He had never wanted to write a book. But he had woken up one morning and that thought was fixed in his mind. It worried him that he hadn’t realised this earlier. 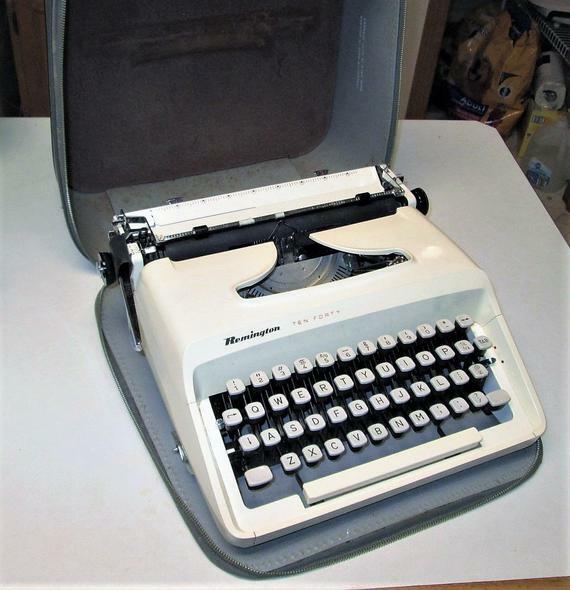 The day he had left the flat, he had no real intention of buying a typewriter, but that thought of writing a book had definitely been there, almost like some sort of implant. He took the phone off the hook, in case he got yet another call from someone he really didn’t know. Time to think again, and to think straight this time. Insisting on being a best selling author was pointless. There was a fair bit of money in it, but the long-term prospects were uncertain, and next year might well see him off the radar, knocked out by the latest big thing. And it came with all that grief too. Agents, hangers-on, even minor celebrity status. People wanted meetings, made demands, and even insisted on things like the ultimatum for the new manuscript. He had visions of having to keep rewriting his life, on a daily basis. So why books? That revelation helped to clear his head. He didn’t need to be a writer after all. He could be anything he chose to be, anywhere he chose to be it. All he had to do was type it up, and wake up to living it, the next morning. It was never about the Sam Logan novels, his former job, or anything else. It was only about the Old Remington. He poured himself a Scotch, and started to jot down some notes on a piece of paper. By six that evening, he had made a decision. Inserting a clean piece of paper into the roller, he lined up the page, and started to type. ‘News reaches us today that someone has finally won the long-running Euromillions Lottery jackpot, the biggest payout in European history. The two-hundred million Euros was won by an Englishman, Martin Harwood, beating the previous record by thirty-one million Euros. The winner decided to go public, as he said he knew he would be hounded otherwise. He hopes it will soon be forgotten, and he can live his life undisturbed, in a location of his choosing. Martin read the short piece a few times, leaving it in the typewriter, unaltered. No more books, no more hassles. Just more money than he could ever spend, and a new life in the sun, away from everything. Now that was more like it. He went into the bedroom to get changed. Maybe he would eat at the Tapas Bar again tonight, and say his farewells to young Pedro. Or maybe he would say nothing. As he stirred, Martin’s mouth felt dry. He could hear a humming sound in the back of his mind, and the sudden squawking of a bird outside made him sit up. Despite bright sunshine flooding in, the air in the room was chilly. It took a moment for him to work it out. Air-conditioning, that was the humming noise. There was movement on the bed next to him, and he turned slowly, wondering what was going on. A woman was stretched out; soft arms above her head, pendulous breasts sagging to the sides, each resting on the sheet covering the mattress. And where they attached to her body, the weight of them seemed to be trying to tear them free from her chest. He sat up quietly, examining her in detail. Under her arms, a large area of dark dots indicated hair regrowth, and lower down, before being hidden by the duvet, her body showed signs of being well-covered by flesh, which rippled like small corrugations above her unseen hips. Long and thick dark hair was draped across her face, concealing her features. He was still staring as she suddenly moved the hair away, and opened her eyes. She raised her eyebrows, no doubt puzzled by his expression. He tried to think hard, forcing that last moment of sleep from his brain. Then it came to him, like rewinding a DVD, and watching the scene again. A bank branch, a perspex window. The sly smile, and flirtatious look. The name tag. He couldn’t hide the surprise in his voice as he spoke. “Vanessa? Vanessa from the bank?” She shook her head, smiling; small creases at the corners of her mouth suddenly making her look very attractive, as they combined into two lines. “Yes, it’s still me, Martin. What is it? A bad dream or something? Maybe you were expecting someone else to be in bed with you? Like that girl who helps the cleaning lady perhaps?” Her tone was friendly. Teasing. She rolled over to the edge, and stood up. Her naked body was very tanned, with no tan lines visible. “I need to pee. Do you want me to bring you back a coffee?” He nodded, mesmerised by her hairless nakedness, and the deep curves of her figure. She looked just as he remembered her from the bank. Except she was wearing clothes last time. Martin propped himself up on the pillows, looking around the bright room, with its unusual decor. He felt like he was on holiday. He was definitely not in England, but other than that, he didn’t have a clue. Here he was, with the woman from the bank. It was something, definitely not a one-night stand, he sensed that. She was familiar, easy in his company, confident being naked around him. He was determined not to just let it all wash over him this time. He wanted to know the hows, whys, and whens. The pieces had to fit together for once, as he was tired of these fresh starts every morning, and the unseen effects that blighted the eventual outcome. He made up his mind to have a serious talk with Vanessa when she came back with the coffee. It didn’t matter if she thought he was crazy, he was going to ask some questions. Looking around the room again, a moment of panic set in. He couldn’t see the old Remington anywhere. Uh-Oh! Where’s the Remington?? Do you have a publisher and an Agent yet Pete?? After you’re finished, go over it again for edit and then pack it off and send it out to some publishing houses. Or do a self publish. It’s fun and the worst that can happen is that nothing happens! This gets better with every twist – well, better for the reader as Martin might have created a deeper money-pit. Oh no! The Old Remington is gone? Why do I think the conversation Martin is about to have won’t be so easy… Excellent episode, Pete. Well, it seems Martin worked a lot of things out…well, except if he hasn’t….we shall see – great writing, Pete! Reminds me of “Bedazzled,” where Elliot (Brendan Fraser) keeps trying to get The Devil (Elizabeth Hurley) to fulfill his wishes correctly. Bedazzled was certainly a Dudley Moore and Peter Cook film – did they do a remake ? – sacrilege! Can’t wait to see what happens when Martin starts asking questions. Replying to both Pete and tidalscribe. Yes, there was a remake in 2000. I haven’t seen the 1967 film. The remake is very entertaining—quite funny! And Elizabeth Hurley is just delicious as The Devil. Ooh, now there’s a twist I hadn’t expected….. They should, she wasn’t mentioned that long ago. That’s great to hear. I’m glad you are enjoying it. It is without doubt the most difficult plot construction I have tried so far, and I have had to keep my wits about me when writing it. But it has been very enjoyable, even though my own favourite serial on here is still ‘Benny Goes Bust. That’s mainly because it contains so many personal connections to my own life. Seems I have a few more serials to read. That’s a good thing.